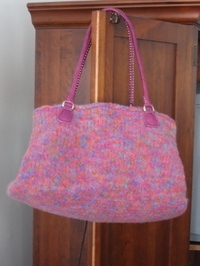 The Fuschia Felted Bag (Ravelry link) is finished! 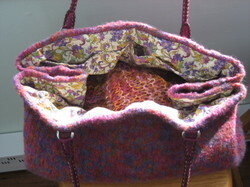 I added a panel to the lining and slip-stitched it into the bag on Sunday. 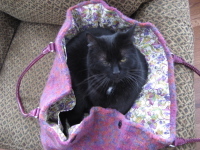 I started the bag as a save for a failed sweater project in October 2007. 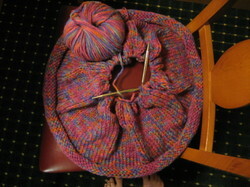 I used US 13 needles both circular and straight. 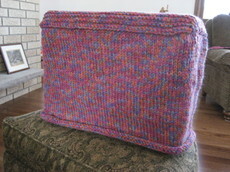 The yarn is Classic Elite Paintbox and I used a bit over 4 skeins. It is my pattern by default, heh. 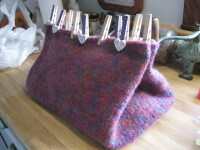 The handles are Grayson Leather handles in Grape. The lining is a nice color match and it came from my quilting fabric stash. I added a few pockets to the lining...I'll have to see what finds a home there. 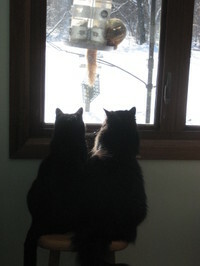 Before I rolled out my yoga mat, I saw Fuzzle and White Dot observing one of our raiding squirrels. It is funny how they are sharing one seat in the "gallery." 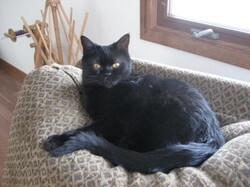 The felines are all friendly to each other but they rarely share adjacent space. 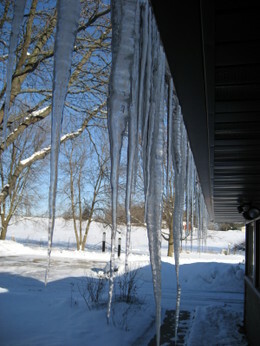 Earlier this week, before this ultra-cold weather, the icicles formed on the eaves. They are a pretty display, but I don't want to walk under them anytime! 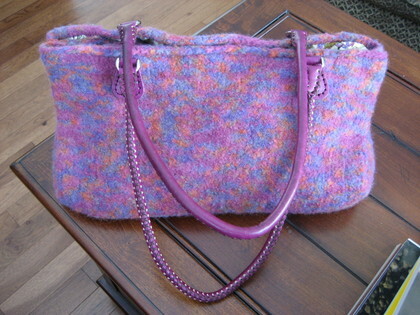 I also worked on the Fuschia Felted Bag yesterday and finally attached all the handles in the correct places. Yes, I had to re-position one handle. I inserted the lining and found I'll need to make the lining a bit larger. I think I will just cut the current lining and add a panel or something along that line of thought. My original measurements must have been a bit off. A nice surprise came in the mail at the end of the day. Joan sent a bountiful box of goodies as my prize for being a fortunately selected commenter in a contest she held on her blog. 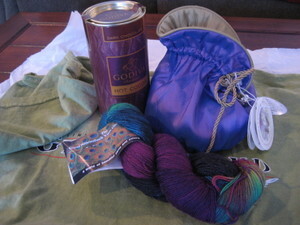 Thank you, Joan, for the t-shirt, yummy lavender-scented bath goodies, gorgeouse sock yarn, and hot cocoa mix. I'm going to have a steaming mug of hot cocoa this afternoon. This evening I'm finishing up the last day of my birthyear and I'll wake up tomorrow with 49 years under my, err, belt skin. I think know I'll be doing some research into behavior modification in the next several months. 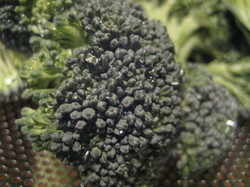 I know that small incremental changes are often successful for me. I just have to figure out how to work *exercise* into my daily routine. I am very much a pleasure-loving person and exercise just doesn't come easy for me. However, I'm aware that I should incorporate more of the *e* into my life if I want to have a quality life in the second half of my time on the planet. Maybe I'll find a way to knit and walk during this 49th year? Feel free to offer suggestions of what has worked for you or for someone else you know. Don't forget the contest! If you comment here any time until Sunday 9 PM Central time, you'll be added to a pool where I'll randomly select two yarny prize winners! Hurray! I'll have birthday festivities during the weekend. 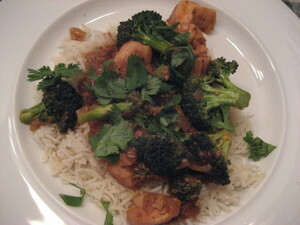 My mom will make my "traditional" birthday dinner (I think!) this Saturday and DH and I will have a nice dinner sometime, probably Friday, since Thursday is a travel day for us both.